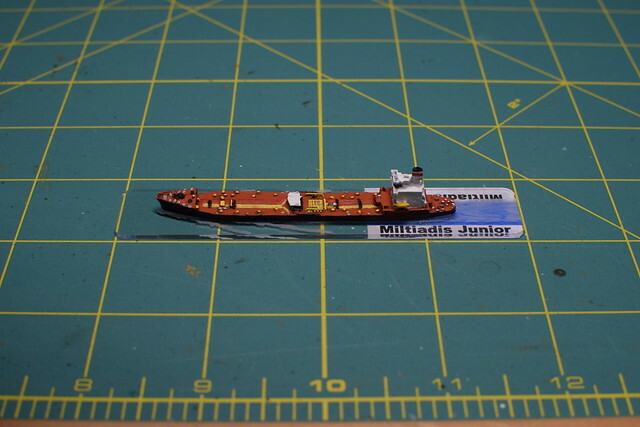 Here are some painted 1/2400 scale modern/cold war naval miniatures. 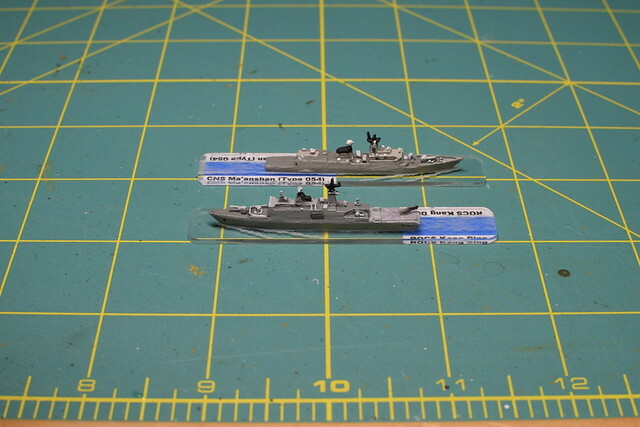 Everything except the Type 022 missile boats is painted by gak8346. 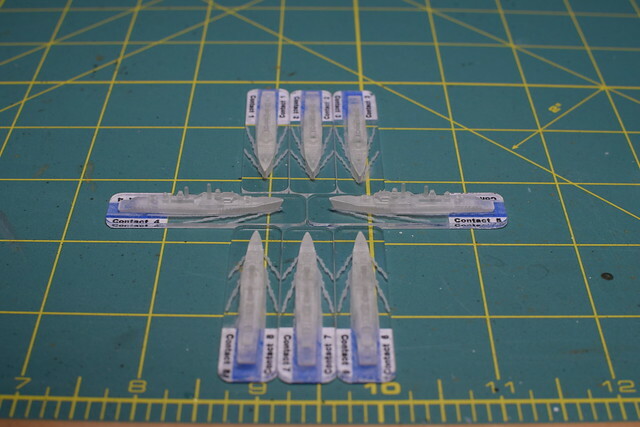 Decals by Flight Deck Decals 2400. Bases without wakes are from Litko using their Base Maker product. 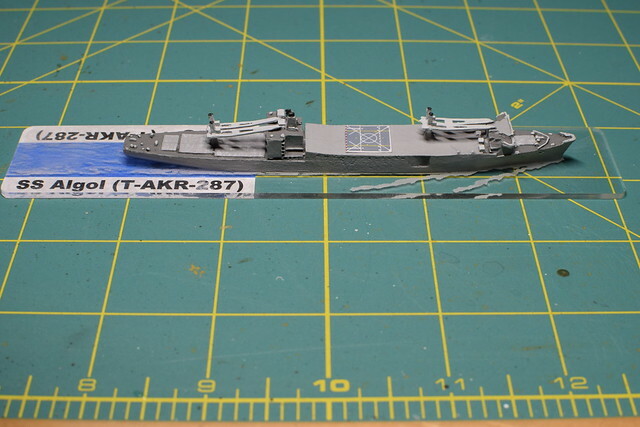 The carrier bases are 2″ by 6″ with a 3mm curved edge. 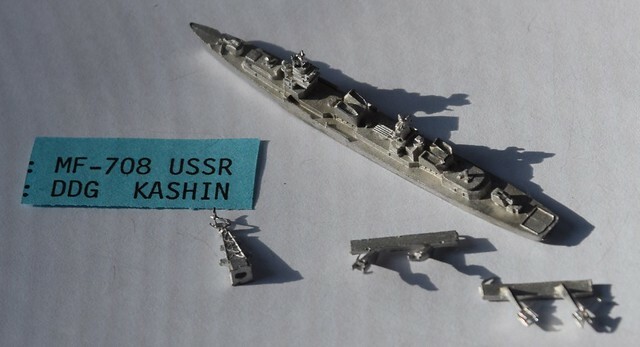 Trawlers and Houbei Type 022 bases are 0.5″ by 1.75″. Bases with wakes are from Old Dominion Game Works. I tried different camera settings so I could get multiple miniatures in focus. Those bases look like the ODGW ones. They look great but I am curious why there is blue in the rear wakes. I love the transluscent ghost ship passive contact markers. Which shapeways model did you use? So, the fact that you have passive markers leads me to believe you intend to game with these, what system are you using? Too bad we’re on opposite coasts! Yes, bases with wakes are from Old Dominion Game Works. I’ll update the post to note that. 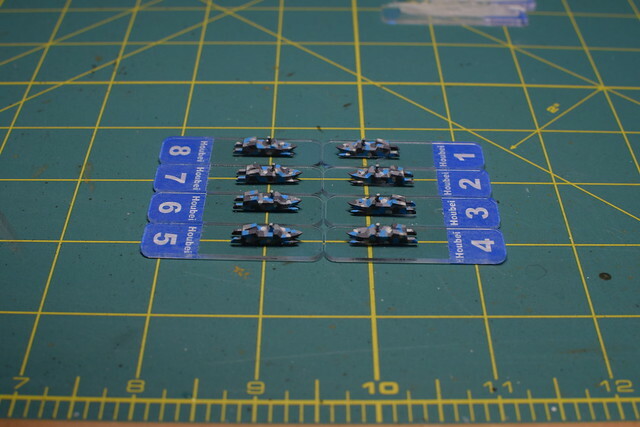 I printed the labels as one piece to make it easier to attach them to the bottom of the base. So that the area under the wakes didn’t appear as white, I set that area to a blue that mostly matches the cloth I use for naval gaming. I made the templates in a spreadsheet and will post the file. 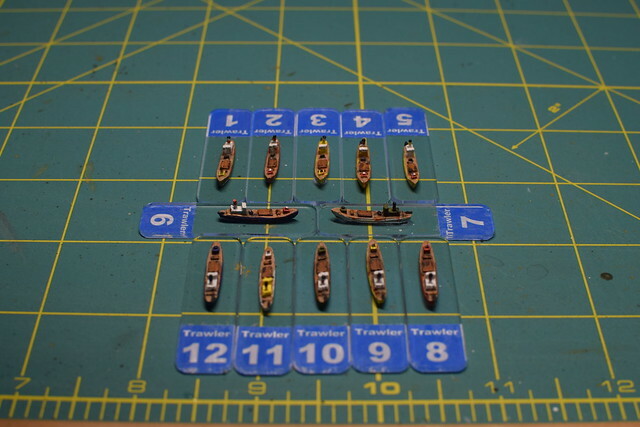 My dummy markers are UK Leopard frigates from Amatuer Wargame Figures. They are printed out in Frosted Ultra Detail. You can find them at http://shpws.me/N48P. They seemed to capture the generic modern warship well enough, though I would have liked to have an other ship type to differentiate the sides better. I have Shipwreck and Harpoon, but find Shipwreck is more to my liking. 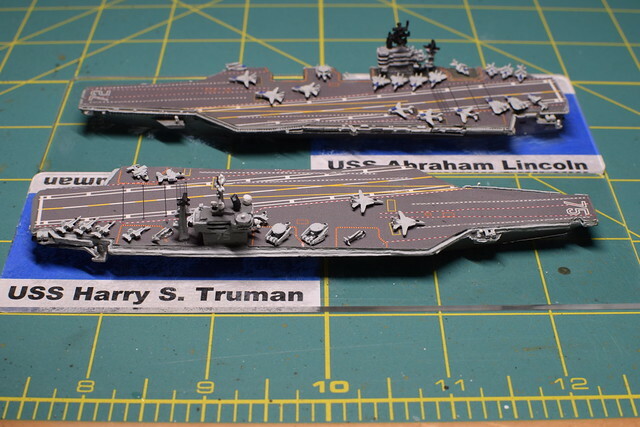 I am looking for a more operational scale game as well. If you ever come to New England, send me a message and we can setup a game. Thanks for the questions! Bases without wakes are from Litko using their Base Maker product. 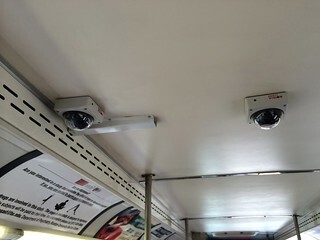 The carrier bases are 2″ by 6″ with a 3mm curved edge. 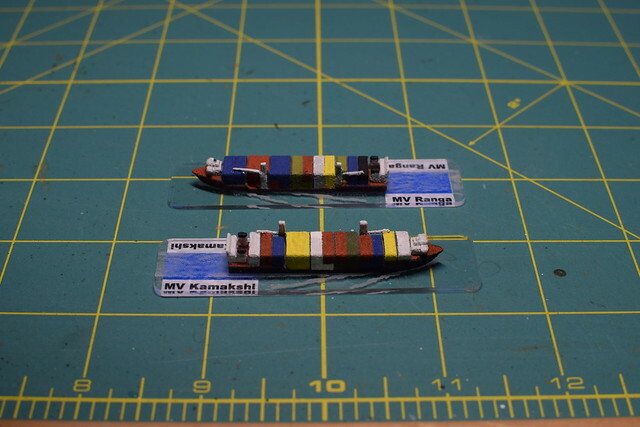 Trawlers and Houbei Type 022 bases are 0.5″ by 1.75″. 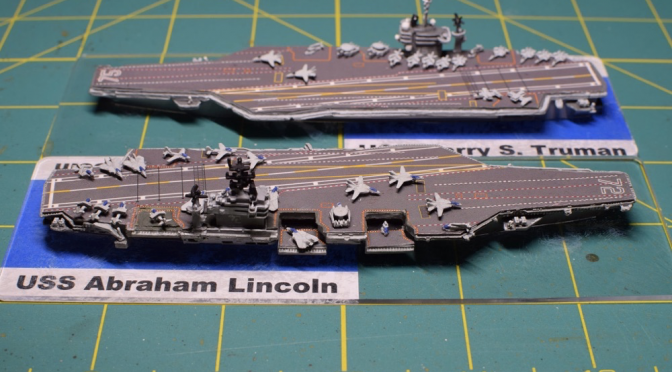 Where do you get those aircraft carrier ?? 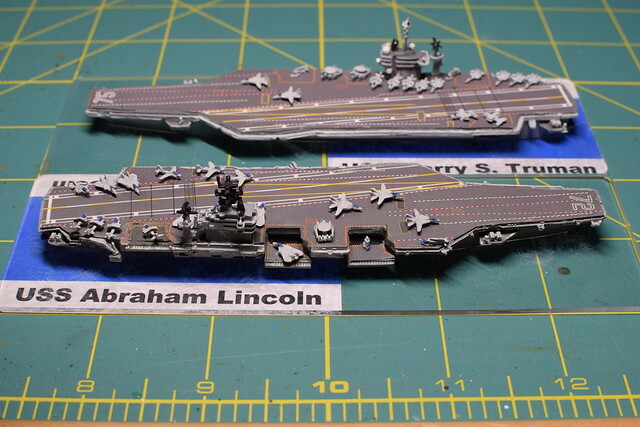 The Truman is Viking Forge and the Lincoln is GHQ.